In a footnote to a recent post, I made the offhand comment that the strangest flowering plants were to be found among the Podostemoideae. Today I'd like to introduce you to them. Podostemaceae is a family of about 270 species of freshwater aquatic plants found mostly in tropical parts of the world. The family is divided into three subfamilies, Podostemoideae, Tristichoideae and the monogeneric Weddellina. The main difference between Tristichoideae and Podostemoideae is that the flowers of the latter developed encased in a sack-like covering called a spathella. Weddellina resembles tristichoids in lacking a spathella but some of the finer features of its flower anatomy are more like podostemoids, to which phylogenetic analysis indicates it is the sister taxon (Kita & Kato 2001). Podostems specialise in living in fast-moving, temporary streams and waterfalls that become dry for part of the year, usually on rocky surfaces. Many podostem species are known for having ridiculously small distributions, often restricted to a single waterway (more on that later). 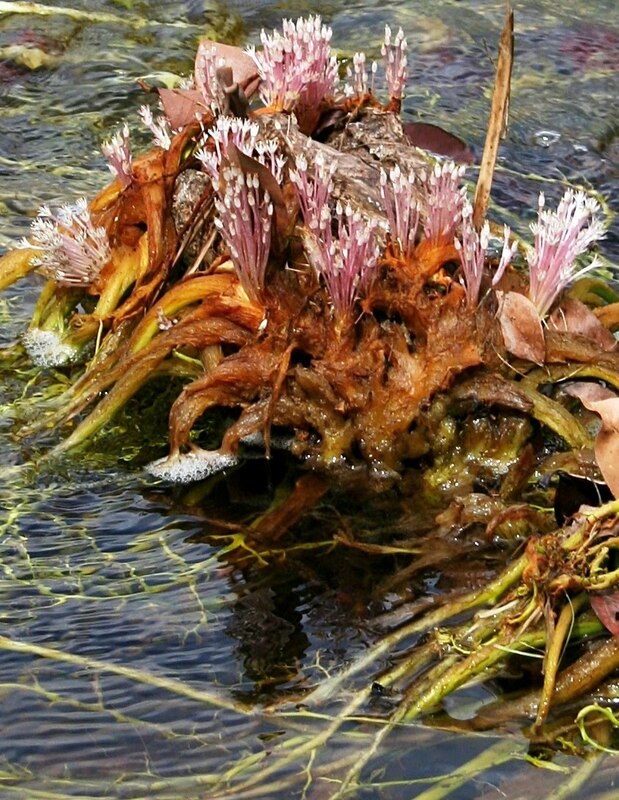 Podostems differ from all other aquatic flowering plants in lacking aerenchyma, the gas-filled tissue I mentioned in reference to duckweeds. The primary podostem morphology involves spreading, usually flattened 'roots' that give rise to branching 'shoots' that in turn produce 'leaves' (Rutishauser 1997). However, all parts are photosynthetic and these structures probably do not correspond directly to comparable structures in other plants. The plumule and the radicle, the initial shoots in a normal germinating seed that develop into the stem and the root, respectively, are absent in most podostems (Sehgal et al. 2002). Instead, the germinating plant body develops as a lateral outgrowth of the hypocotyl, the stem that would normally support the plumule. The plant attaches itself to the rock by small rootlets growing from the 'roots' or by disk-shaped holdfasts. Either the rootlets attach themselves in pre-existing films of adherent bacteria (Jäger-Zürn & Grubert 2000) or they may secrete their own sticky mucilage (Sehgal et al. 2002). In the Indian Dalzellia zeylanica the distinction between 'roots' and 'shoots' has disappeared entirely; instead, the plant grows as a crustose thallus bearing both rootlets and 'leaves'. 'Leaves' of podostems are varied in appearance from large compound structures up to two metres long to minute scales or bundles of filaments. Species with larger leaves often have hairs, prickles or warts covering their surface. The South American podostem Rhyncholacis penicillata in flower. Photo by Berrucomons. 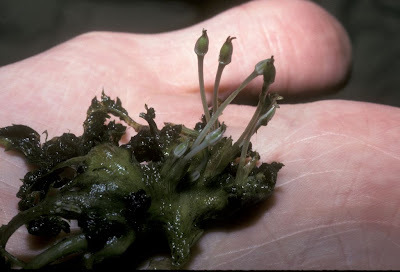 The flowers of podostems, whether covered by a spathella or not, are very variable. Inflorescences of Mourera fluviatilis (the species with the two-metre leaves) can be up to 64 cm tall including the spike with up to ninety flowers. Other species (including all Tristichoideae) may bear only a single flower on a short stem. Depending on the species, podostem flowers may be wind-pollinated, insect-pollinated or self-pollinated. 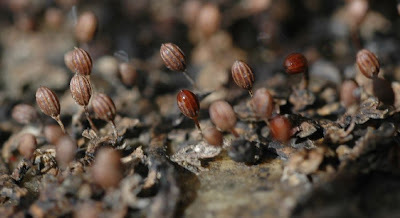 Podostem seeds are tiny, wind-dispersed and lack endosperm (podostems lack the double fertilisation of most flowering plants). 1g of weight may contain over a million seeds. Fruits vary greatly in size between species - Mourera fluviatilis may produce fruits containing up to 2400 seeds each while Farmeria metzgerioides produces only two seeds per fruit. In the case of the latter, the fruit doesn't break open to release the seeds; instead, the seeds germinate in place over the remains of their parent. Podostemon in the dry season: desiccated thalli holding maturing fruits. Photo by Renato Goldenberg. Much speculation has been conducted on why so many podostems have restricted distributions. Some have implied that many podostem 'species' may turn out to be ecological variants of more widespread species; however, multiple podostem species may be found growing in a single habitat. Others have suggested that podostems are somehow under less selective pressure morphologically than terrestrial plants, allowing a higher rate of mutational drift; however, this proposal remains untested. Interestingly, the molecular phylogenetic analysis of Kita & Kato (2001) found that the highly modified Dalzellia zeylanica was closely related to the morphologically conservative Indotristicha ramosissima. Indeed, the genetic distance between the two was little greater than that between separate populations recognised as the single species Tristicha trifaria, unusual among podostems in being found in both Africa and the Americas. This would suggest that podostems are indeed capable of rapid morphological changes—the only question is how? Jäger-Zürn, I., & M. Grubert. 2000. Podostemaceae depend on sticky biofilms with respect to attachment to rocks in waterfalls. International Journal of Plant Sciences 161 (4): 599-607. Kita, Y., & M. Kato. 2001. Infrafamilial phylogeny of the aquatic angiosperm Podostemaceae inferred from the nucleotide sequences of the matK gene. Plant Biology 3 (2): 156-163. Rutishauser, R. 1997. Structural and developmental diversity in Podostemaceae (river-weeds). Aquatic Botany 57: 29-70. Sehgal, A., M. Sethi & H. Y. Mohan Ram. 2002. Origin, structure, and interpretation of the thallus in Hydrobryopsis sessilis (Podostemaceae). International Journal of Plant Sciences 163 (6): 891-905. Great post. Hadn't realised that they were this weird. A great example of extreme adaptation. Are there any intermediate forms which might illustrate how something as bizarrely derived as a podostem evolves from an upright land plant? More evidence that Nature has a better imagination than Hollywood. Indotristicha apparently retains a radicle though I'm not sure how it's development compares to other podostems. Other species may have more 'normal' features in other organ systems. The odd thing is, as mentioned in the post, extremely derived forms may be closely related to quite conservative forms. I'm just trying to inagine a situation where something like a Clusia or a St John's Wort is sitting in a swampy/marshy/aqueous landscape and goes - right, babies, the only way to thrive here is to fundamentally re-engineer the entire plant developmental blueprint - let's start from scratch...! Can't think of anything byt a hopeful monster in this situation. There's no gradualist scenario which makes sense, is there? The interpretation of Sehgal et al. (if I understand correctly) is that the podostem body (including the 'roots' and 'leaves') is basically a highly modified stem structure. Leaf- and root-like stems are certainly not unknown in other plant groups (think rhizomes, phyllodes). Adventive rootlets are known growing from stems in other plants as well (banyan trees, etc.) I have to admit that I'm not too familiar with developmental genetics in plants but I'm also thinking of redirection of the genes controlling development which may explain some of the features of podostem 'roots' resembling true roots.